I spent Saturday trying to make up for what a flop Friday had been. It was better. I won’t say that I mastered scream-free parenting, but it went well overall. We spent the majority of the day out grocery shopping (and that can take a while when you start out at the mall to get some new jeans for the kiddo and there are six stores on the agenda). But Sunday was when the day was really awesome. And it was a day that was even closer to scream-free parenting right up until we went to Grandma’s house for Sunday dinner. I spent Sunday morning puttering around the house and trying to clean up. I have symphysis pubis dysfunction, and all the walking that I’d done on Saturday left me hurting quite a lot. But still, I was determined to have a little fun. I knew that I felt like an absolute Super Mom on the day that I made a cake with Norton. We had a lot of fun. I really wanted to recapture that feeling… but I wanted to do something a little more hands on. I found a recipe for making Rice Krispy Pumpkins through blog bouncing (not an official hop, but clicking a link to a link to a link, etc) that I knew I wanted to do. I love Rice Krispy treats. I really do. They’re easy to make and pretty kid friendly, even if they aren’t the most nutritionally sound treat. Once the cooking on the stove part was done, that was when the fun started. The husband covered the kitchen counter with wax paper while I got Norton washed up and ready for a little toddler fun. When I first put Norton on the kitchen chair at the counter, he wasn’t sure what to think. He very nearly started to cry, and did complain a bit when I sprayed Pam on my hands and then rubbed some on his. Once he saw me reach for the pile of orange Rice Krispy goo, all complaints were gone. I put a bit in his mouth and then I had a blissfully happy toddler. 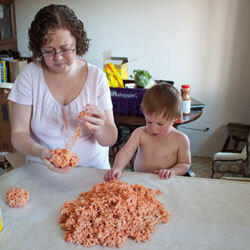 While I worked at forming the Rice Krispy goo into balls, Norton was grazing. Then he stole one for himself. I did have the husband in the kitchen to take pics and to butter my hands throughout the process. It turns out that Pam doesn’t have the greatest non-stick properties when challenged with warm marshmallow goo. 🙂 We pushed the Tootsie Rolls in a bit before the Rice Krispy treats got firm, and then the husband mixed green frosting dye in some cream cheese frosting and painted on the leaves and the vines. 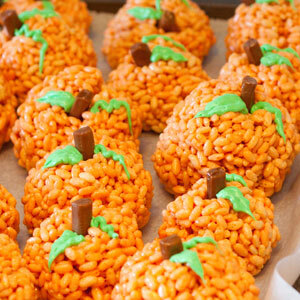 The pumpkin rice krispie treats look so cute! Also yummy!